There aren’t many foods that can satisfy cravings like a nice toasted sandwich, with the simple invention the hero of university students and busy families everywhere. Otherwise known as a toasted sandwich maker, a sandwich press can create a warm feed in minutes, making it perfect for when you don’t feel like cooking, or you simply don’t have the time. While it might not be a science to create a simple cheese toastie, with even some toasters able to create toasted sandwiches, finding a sandwich press that creates consistent toasted goodies may be a struggle for some, especially if you have plenty of hungry mouths to feed. To help take some of the stress out of the decision, Canstar Blue has compiled a list of some of the more common brands of sandwich presses you will find at your local retailer, and just what to expect when you take it out of the box. Often considered the creator of the sandwich press, Breville offers one of the largest ranges of toasted sandwich makers, with plenty of options available regardless of your household size or budget. Starting at just $50, Breville is competitively priced in the market, making it a worthwhile brand to investigate if you’re not sure what you’re after. Breville’s introductory model – simply named ‘The Original’ – is able to cook two large toasties, with Breville allowing for larger bread types and bulk fillings if you’re really hungry. This model has non-stick plates to ensure you’re not left with a mess afterwards, with a notification light to let you know when your food is ready to be eaten. 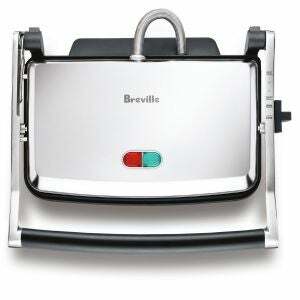 Breville also offers the Toast & Melt series, which comes in the standard model, in addition to a 4-slice model. Main features include a floating hinge, which automatically adjusts to ensure even pressure on both thick and thin ingredients, as well as four adjustable height settings, helping you to heap on the fillings without struggling to close the lid. The 4-slice model comes with similar features, plus the extra capacity for when lunch time comes around, with the extra space costing you under $100, depending on your local retailer. If you like your toasties light and fluffy, the ‘Perfect Press’ might be the model for you, with Breville constructing the appliance with a counterweight hinge to ensure the top plate applies less pressure, taking the stress off your sandwich and its fillings. With non-stick plates, vertical storage for space saving and a 2-slice capacity, the Perfect Press may be a handy addition to households, although it is Breville’s most expensive model, costing around $130. With a nod back to the company’s past, the ‘Original 74’ sandwich press is similarly designed to Breville’s first model, with the stainless steel appliance coming with a handle for easy portability, ideal for when the kitchen gets busy. The Original 74 also has the capacity to fit large bread types, including croissants and flat breads, with deep pockets allowing users to jam-pack their sandwiches with fillings. While it might not have the range of some competitors, Russell Hobbs still has enough on offer to suit households of all sizes, with affordable models available at local retailers. With two primary models, Russell Hobbs may be the brand to consider if you’re after something that stands out in the kitchen. Russell Hobbs’ standard sandwich press is available in both eye-catching red and brushed stainless steel for those keen on their kitchen aesthetics, with this model equipped with features such as its non-stick plates and a floating hinge to suit all sandwich and filling types. The model can also fit up to four slices, making it ideal for larger households, or those keen on their toasties. The Deep Fill, Russell Hobbs’ other model, also has a 4-slice capacity, with deep fill plates helping you to pile in the fillings. With vertical storage and a temperature indicator light, the Deep Fill is an ideal model for those after a simple sandwich press. A veteran of the appliance market, Sunbeam has plenty of products available for you to fill your home. With the sandwich press no exception, Sunbeam provides a number of models for customers to choose from, with the range split into two main series – the Big Fill and the Café. The Big Fill series consists of a 2-slice and 4-slice model, both of which include features such as deeper dishes for larger sandwiches, non-stick coating for easy cleaning, as well as a cut and seal design to help ensure your toasties come out ready to be eaten. The Café range includes a variety of models, including the Compact Café Grill, Compact Café Press, the Café Press and the Contact Grill for all your toasted sandwich needs. Retailing between $50 – $100 on the Sunbeam website, the Café range may be well worth checking out if you’re in the market for a new sandwich press. All Café models include a ribbed top plate to grill meat as well as sandwiches, with each designed with a floating hinge to ensure even pressure and toasting on all your sandwiches, no matter how jam-packed they are. The more expensive models have adjustable height settings, with the Contact Grill additionally equipped with removable drip tray for those looking to grill meats. Well-known for its range of homeware & kitchen appliances, French manufacturer Tefal has thrown its hat into the sandwich press ring, offering a range of appliances with sandwich press capabilities. While they might be able to do a bit more than create a cheese toastie, if you’re looking to combine a few appliances into one, Tefal might be a brand worth checking out. 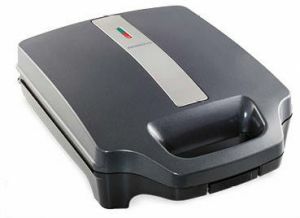 The SuperGrill, Tefal’s first model on offer, features an adjustable thermostat to grill meat, vegetables and sandwiches to your preferences, with Tefal also including a sloped design to allow for grease drain off. With non-stick dishwasher safe plates and adjustable positions for optimal grilling, the SuperGrill may be a handy appliance to have if you’re pressed for kitchen space. Tefal’s other option, the Snack Collection, offers even more variety, with interchangeable plates to allow users to create waffles, pancakes, donuts, biscuits as well as toasted sandwiches, with a recipe book also coming with the model. Retailing for just over $100 at local retailers, the Snack Collection could be the model for you if you like baking and creating in the kitchen, but might not be worth the price if you’re simply after a toasted sandwich. Aussies go crazy for Kmart thanks to its cheap and cheerful small appliances including sandwich presses. It has four models in the line-up ranging between $7.50 – $29 on the Kmart website. Expect non-stick plates and various sizes. 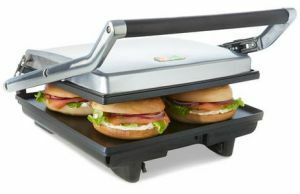 Its $29 model offers 2000W of heating power, fitting up to four sandwiches while another model for $19 has space for two. Both have standard warm up and ready light indicators, plus a 12-month warranty. Kmart’s $7.50 model is a simple option, fitting up to two sandwiches and can stand upright for compact storage. ALDI is well known for its Special Buys, which features a number of essential household appliances throughout the year including a sandwich press. 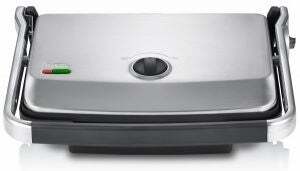 ALDI’s Deep Sandwich maker retails for $29.99 with a one-year warranty. 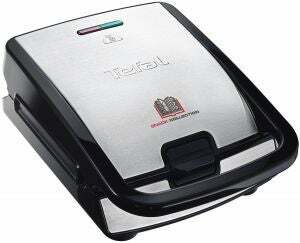 It’s boasted for non-stick deep plates with capacity for four sandwiches. It’s also stated to cut and seal edges for a mouth-watering finish. 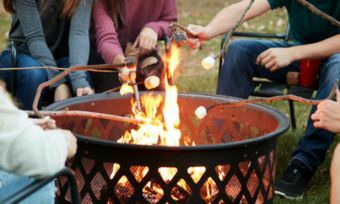 Stocks are always limited and it typically makes an appearance once a year, so you’ll have to keep an eye on ALDI’s catalogue to see when it will be back in stores. Which sandwich press should I buy? While you might think you don’t need a lot to create a good toasted sandwich, having options in terms of size and functionality could allow you to create something more than a simple toastie – especially if you like loading up on the fillings. Additionally, with some brands offering grilling capabilities with their sandwich press models, you might save money and kitchen space by purchasing one that can do it all. What you cook in the kitchen however, will also come down to personal preference and circumstances. Larger households may be better off buying 4-slice models, while models with adjustable height settings more suited for those who prefer bigger meals. Ultimately, which sandwich press you walk out the door with will depend on your budget and preferences, so shopping around and doing your research before buying will set you up in the long run.